During Toronto’s rapid Victorian build-out, the tidy, right-angled grid of streets and roads being pushed across the landscape frequently collided with the railway corridors that sweep diagonally through the city. Among the results of this mismatch were numerous small, oddly-shaped crannies and nooks of land, backed on to the tracks, that residential developers have traditionally been reluctant to build on. Their negative attitudes toward these orphaned spaces have been changing, however, as the downtown area’s ongoing intensification gobbles up the last properties that are easy to develop (such as large parking lots), leaving only the more problematic ones up for grabs. Interestingly, some places of the latter sort have been occasions for striking architectural gestures – the gracefully tall, romantically textured Massey Tower, on Yonge Street, for example, and the mid-rise complex known as Context King West, both designed by David Pontarini, a founding partner in the firm of Hariri Pontarini Architects (HPA).As it happens, Mr. Pontarini and his people at HPA are the authors of a still newer residential project on a geometrically challenged spot in downtown Toronto: Garrison Point, a five-tower development whose sales office (for the first two buildings) has opened at 35 Strachan Ave. 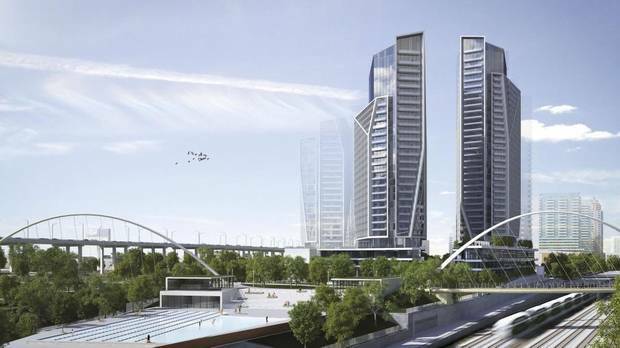 The proposed heights of the buildings that have been taken to market are 35 and 29 storeys. Together, they will contain 684 units ranging in size from 511 square feet to 1,300 square feet. Town homes are available, and they vary in area from 1,170 to 2,080 square feet. Advertised prices for apartments start at around $550 a square foot. The financial partners in this scheme are Cityzen, Fernbrook Homes and DiamondCorp. These conspicuous players in the local real-estate market – all three have sponsored architecturally significant condominium towers – cobbled together Garrison Point’s wedge-shaped site from bits and pieces of old industrial land at the junction of two rail lines immediately east of Liberty Village. Both lines carry GO commuter trains. One will be the route of the express transport connecting Union Station and Pearson Airport, which suggests that anyone thinking of taking up residence in Garrison Point should be a fan of the railways, since he will have trains on two sides. One problem that commonly afflicts such unusual spots in the urban fabric, and that makes them less than desirable for housing, is the sense that they’re isolated dead-ends. The thoughtful master-plan for the site of Garrison Point, which has been crafted by Urban Strategies, the private city-design group, proposes to remedy the situation in a couple of ways. One involves enhancing little Ordnance Street, which exists now as a rough, rubbly extension of East Liberty Street, in order to link better the buildings to Strachan Avenue and Liberty Village beyond. Another involves making provisions for a path that would run across the park projected for the site’s eastern extent – the sharp end of the wedge – and connect with city-owned pedestrian bridges bounding over the railway corridors to public green spaces on both sides. I hasten to add that, as far as executing the master plan goes, only a partial beef-up of Ordnance and the erection of two towers are included in the current phase of work. The park (which is to be designed by Montréal landscape architect Claude Cormier) is not happening now. The foot bridges that the city has set aside money to build are still in the future. But even though the present, initial phase will embody only a fraction of the interesting general vision for this little parcel, good things can certainly be said about that fraction. The best of them has to do with HPA’s attractive, inventive forming of the first two towers in the project. Instead of shoe-horning ordinary square or oblong blocks into the irregular site, the architects have decided to celebrate the place’s irregularity by structuring it right in. The light exterior surfaces bend and shift, sharp edges are sliced away. Each tower appears to be composed of two jauntily different vertical slabs that have been joined and put on a low pedestal, like imaginative abstract sculpture. We won’t know what the three remaining towers will look like until later, but the tall buildings now on the market promise to be memorable. They will be ingenious responses to one of this city’s awkward corners, and (if they sell well) smart counter-statements to architects, developers and others who claim that the only kind of high-rise that will fly in the Toronto market is another dumb box.